Students of VCFTC’s flight instruction at Oxnard Airport in Ventura County are trained on one of the industry’s leading training aircraft, the Cessna 172. A four-seat, 180-horsepower Cessna Skyhawk powered by the Garmin G1000 avionics suite, this aircraft provides the ideal environment for your flight instruction and training. 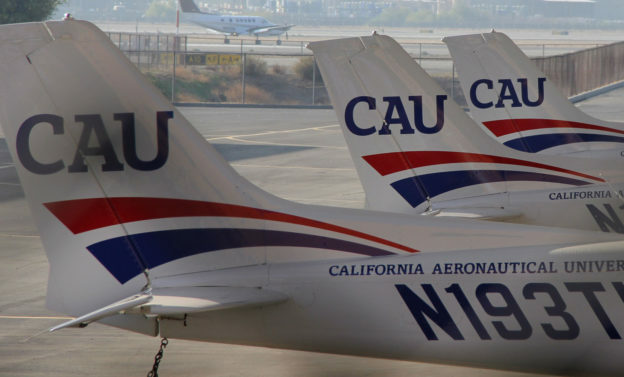 Learn more about our aircraft by viewing this Plane Talk video from California Aeronautical University. Interested in expanding your horizons with flight instruction? Schedule your introductory flight training session at the Ventura County Flight Training Center today. This entry was posted in Uncategorized and tagged Aviation, Cessna 172, Cessna Skyhawk, Flight Instruction on February 19, 2017 by Monica Raymond. Why do you want to learn to fly? Thinking about getting your pilot license?